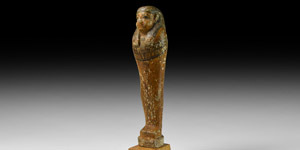 A wooden Ptah-Sokar-Osiris figure with square base, painted detailing to the face, tripartite wig, collar, vertical band of hieroglyphic text on the body and the dorsal pillar; 'Ant Maspero', son of the famous French archaeologist Gaston Maspero, written in pencil to the base. 170 grams, 26.5cm (10 1/2"). Fine condition. Property of a North London gentleman; previously in the Vaudehaute family collection; acquired from an auction at Hotel Des Ventes, Rouen, France, 4 November 1975, lot 9; accompanied by the original auction invoice.